He spoke on March 12 at St. Michael's Cathedral in Toronto. 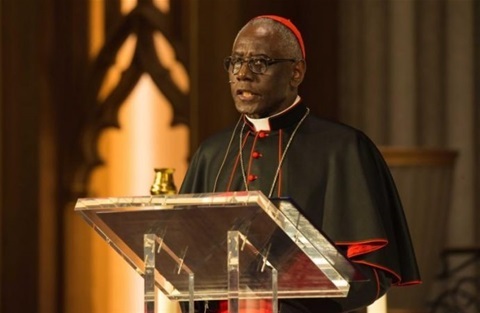 Cardinal Sarah has many supporters. TORONTO, Canada - One of the Catholic Church’s most outspoken leaders urged a rapt audience in St. Michael’s Cathedral to embrace silence and be alert to the danger of filling their days with constant news and distraction. His lecture had originally been scheduled for St. Basil Church on the campus of the University of St. Michael’s College, but the free, online tickets were quickly snapped up, and it became apparent that the church was too small to meet the demand. Sarah has made news with pronouncements on liturgy that have not always agreed with Pope Francis. At a 2016 liturgical conference in England, he encouraged priests to celebrate Mass “ad orientem” (with their backs to the assembly), prompting a clarification from the Vatican press office. In 2017, his office released a commentary on Francis’s “motu proprio” in which Sarah seemed to dispute the pope’s decision to remove the authority over liturgical translations from his office and restore it to conferences of bishops. Sarah was subsequently corrected by Francis in a public letter. But the Toronto lecture left the liturgy wars aside and concentrated on the message of the cardinal’s most recent book on the importance of silence in people’s spiritual lives. He laid out precisely how a Christian can acquire the freedom, dignity and will to discover a deeper life in Christ. The one tool at every Christian’s disposal must be silence, Sarah said. Though university students were a minority in the crowd, Sarah had prepared his remarks for a youthful audience. He challenged students to abandon their smartphones and other distractions and discover prayer and contemplation in silence. Marvels of technology have made it more difficult to know and to learn the value of silence. Sarah urged his audience to keep technology in its proper place.